This section describes the hierarchy of Spring MVC Module. 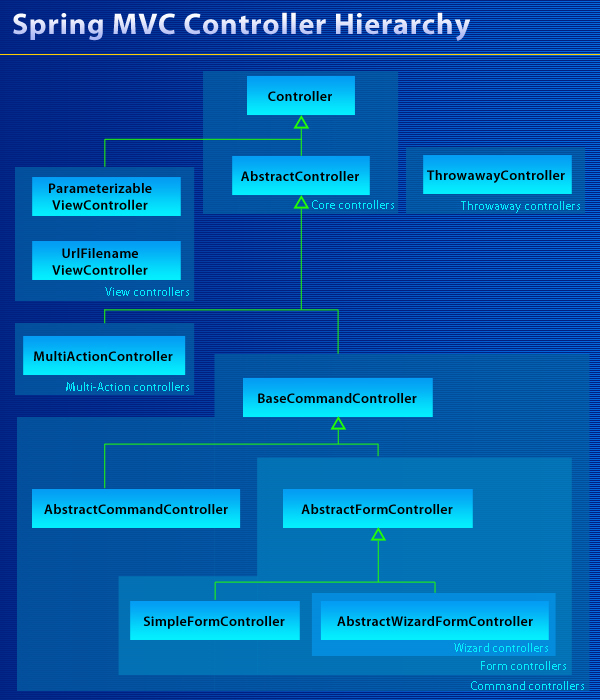 In this we will will understand the controllers hierarchy in Spring MVC Module. The Spring MVC module provides a lot of flexibility to easily develop MVC based web applications. It provides many controllers that can be used to achieve different jobs. In this Spring MVC, DispatcherServlet works as the controller and it delegates the request to the Controller. Developers extends the abstract controller provided by the framework and writes the business logic there. The actual business related processing is done in the Controller. In the next sections we will be learning about all these controllers. We will also provide you the examples codes illustrating the usage of these controllers.